I think out of the whole race, the first trek was the hardest, because it took us forever. 80k over technical mountainous terrain. Lots of big blocks of rock that were or were not overgrown by various plants, so also lots of holes to twist your ankles in (which we luckily didn’t do). Arjan killed his bugs quickly and I felt fine too. The views were stunning: sun set just when we reached the highest peak. This area of the Pyrenees is very remote, and we didn’t cross a single village in those 80k. Unfortunately Harm got very ill after the first night and was only able to walk for about 10m before emptying his stomach again. Then onto the next 10m. And again. This delayed us quite a bit, but we managed well as a team, we took turns carrying his backpack and remained positive. We slept 15 minutes to help him recover, but were also pushing to make the deadline to do the full course. The nice thing about multisports events is the fact that there are multiple sports involved. After being on our feet for 34 hours, they slightly hurt (a lot) and we really looked forward to do a bit of rafting. Unfortunately it took us still an hour and half to find the rafting section. It turned out that a lot of roads on the map didn't exist anymore. After a nice bush-hacking experience, we finally made it to the rafts. This was amazing!! I'd never rafted before, but so nice to be off our feet for a while and on the water. The sun was hot, and this was just perfect. The sun and the class IV rapids helped us stay awake for sure! Then on our bikes for a 90km mtb ride. After a few kilometers Arjan discovered that his back wheel was being very iffy. It was at the verge of breaking and we again had to deal with issues. Harm still couldn't properly eat and was low in energy, so we put him on Arjan's bike and we took turns pulling him and the iffy bike up the mountains, hoping this solution would last for the next 85k... We passed one village during this stage, and spend time to find the right tool to fix Arjan’s bike. Unfortunately, after a good attempt of a friendly guy, we still hadn’t made any progress on it. We decided to push our luck and went into the third night now. This normally is the first night that I tend to get tired. Harm and I were fighting against sleep, while Maarten and Arjan were working hard to find our way. Unfortunately we then also made a big orienteering mistake and it took us 4hours to make progress of about 600m in the bushes (there was no path again). These things happen, but we knew we weren't going to make the deadline to do the full course. We’d simply had too many things to deal with: a broken body, a broken bike, trying to fix that bike, and finally a navigational mistake. This was a bit of a bummer, but we hoped we would make all the other deadlines. On the upside, Arjan’s bike still worked fine after the 1200m downhill section just before the TA, and we decided not to worry about it anymore. We slept 4 of our obligatory sleep hours at the TA before we set off on our bikes again. Another 60k of mountainbiking. Harm was feeling better now, and we could take up a bit more speed. Arjan’d drunk too much water towards the end of this section, and after emptying 1.5 liters of water out of his stomach, he needed some time to reset his stomach. When we arrived at the TA, we left him for 15 minutes, forcing him to stuff a hot meal down his throat, while we were preparing for the canyon. Luckily he recovered rapidly. The canyon was amazing. Good timing as well, because we were able to do it in daylight. The water in the canyon was cold, but the views were stunning! There was a monastery high above the canyon, which we finally entered via caves. Very cool! We continued with a hiking stage directly after the canyon, but we had to take our wetsuits with us for about 3 hours to the next CP (which Maarten enjoyed a lot, he also carried Arjan’s wetsuit because Arjan still felt a bit weak after emptying his stomach earlier today). We went into the fourth night and slept another 3 hours of our obligatory rest at the CP. 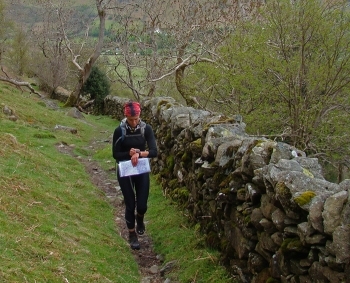 After setting off again, we found a lot of teams just before CP20, who hadn't managed to find this CP. We also spent time finding it, but when it finally got daylight again we easily managed. There was a steep path on the ridge that led to a highline and via ferrata that were specifically made for this race. Just amazing!! We quickly got onto our bikes for another quick 17k of mountain biking, which was basically a transition to another canyon and castle for more rope activities: rappelling & swimming. Cold water, but stunning views, we felt so lucky to be there! Experiences just got more intense with so little sleep. We were racing for 4 days non-stop now and still continuing easily. I amazed myself by how strong I felt, I could have gone faster even. Then onto our bikes for the last mtb section. Another 40k, but not too much of altitude this time. A lot of roads weren't on our map, but the fantastic navigational skills of Maarten helped us to reach the TA to the kayaks fairly quickly. We still had 4 hours of obligatory rest to do, and we decided to do 2 now, and 2 during the kayaking stage (70k of kayaking is so loooooongg). After 2 hours of sleep we got into our kayaks (5th night now). Unfortunately Maarten gave Arjan and myself some great advice not to take the highest-powered lamps... This kept us awake for the first few hours, because going through rapids with only the lights of your headtorch is challenging. Luckily the sun set after a couple of hours, and also the river got easier. It took less energy to stay in to boat, but more energy to stay awake. And so we started our jukebox. I think next to sore backs and arms from the kayaking, we also got sore throats from the singing. We were happy we still had to sleep 2 hours halfway through, and it was nice to dry up in the sun. We reloaded our batteries for the final section of kayaking and sea-kayaking. The sea was fairly wild, and it was amazing to be here, knowing we were about to finish the race. The sun just went down as we pulled our boats to shore to clip the final CP. And then, just around the corner was the finish. What an amazing experience!!! We danced, drank champagne, ate pizza and drank beer. We celebrated well, and then, finally, slept well (ooh a bed can be soo nice!!). Thanks Maarten, Harm and Arjan for racing with me, and for making this such a fun and unforgettable experience. Thanks also everyone from around the world for following us and sending us your positive vibes. It was great to receive your messages halfway through, and it’s great to learn that so many people have been following us. Thanks! Also huge huge thanks to the excellent organisation and volunteers of the Raid in France, who made this all possible and who worked tirelessly to make this all happen. The route was magnificent, the logistics were spotless and all volunteers kept smiling at every CP which helped a lot. Special thanks so Pascal and Bea for everything. I think I learned yet again that humans are capable of so much more than we thought we are. I amazed myself and I learned that I am even stronger than I thought I was, I could have gone on for much longer and faster if necessary. There is a lot of potential to be discovered still! Adventure racing is such a beautiful sport, which allows you to go off the grid for a couple of days to spend your time with crazy team mates pushing yourself through nature’s most beautiful surroundings. What else could a girl wish for than finishing this experience with the most amazing teammates? Thanks guys, I’m proud of us! We did great as a team, and we tackled all hurdles well. I loved it! !